Last but certainly not least, my CNY treat #6 is Kuih Bangkit. 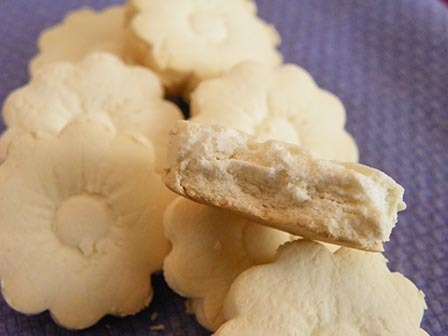 Kuih Bangkit is a delicious, melt-in-the-mouth coconut-flavored cookie. It is in fact my all-time favorite CNY cookie! 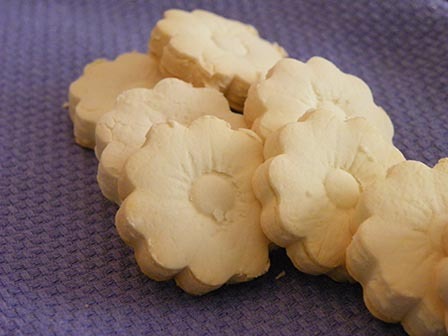 Here’s the problem – it is probably (for me) the most challenging cookie to make. Most Kuih Bangkit recipes use tapioca flour (aka tapioca starch), which creates a super-stiff dough that’s extremely hard to handle. How hard? Hmmm…I had wished the first batch of cookies that came out of the oven was a complete failure just so I could throw away the rest of the dough. LOL! The first requirement in a Kuih Bangkit recipe is always to fry the flour until light. The idea is to remove most of the water content and replace it with the creamy, fragrant coconut milk. However, the time recommended to complete this task can vary anywhere from 30 minutes to 2 hours, depending on individual recipe. I find it almost impossible to get a consistent result everytime (especially not knowing how “light” is light enough). Nevertheless, after everything is said and done, I would have to say that all the time, effort, and frustration spent in making these delectable cookies is well-worth it (of course, I have to keep popping them in my mouth to remind me of that fact ;-D). This time, I tried Sonia’s (of the Nasi Lemak Lover blog) Kuih Bangkit recipe. The dough was still hard to work with (like other recipes I’ve tried) but the cookies were indeed melt-in-the-mouth and they were delicious! Note though that I used only tapioca flour and not a combination of tapioca and sago flour since I can’t find sago flour where I live. Same goes for the coconut milk – I used canned instead of freshly squeezed coconut milk. Thanks for trying, this is one of my favourite too. This year I have no time to make this, I must make this in next year using my new animals character mould. Oh,man! This has always been one of my "to do" lists. I am so clumsy where baking is concerned. I'm trying to find short cuts, easy recipes which turned a perfect picture of the final outcome AND yours turned out so good! Was your "helper" there to assist you? :-) Oh btw, did you fry the tapioca flour with some pandan leaves? It will make your cookies doubly fragrant.